The LN2DS-V002 is the safest liquid Nitrogen dispenser available today in the market. Manufactured in USA, withhold up to 1,000 PSI, is 100% stainless steel and the main valve is enclosed in a hard anodized aluminum case. This liquid Nitrogen machine has a 1 yr. warranty. ​Connect two LN2DS-V002 in a short distance using one single vacuum jacketed cryogenic hose. ​The top of the line in digital dispensing systems for liquid Nitrogen is our tablet control ELNDS-V001. The system made in USA is activated via Wi-Fi using a tablet. The Tablet is updated from our own cloud system; all formulas, flavors, liquid nitrogen profiles, etc. can be updated and programmed in the cloud and then updated with a single click to all your tablets and stores, no need to program each tablet or store individually. To use this system a safety flow control valve is required (in the picture the ELNDS-V001 is connected to our LN2DS-V002 working as a safety flow control valve). The LN2DS-V002 is integrated with a Vollrath 7Q mixer. - Colors in the mixer can be customized from original silver body with blue lid. The 2 inch thick, vacuum jacketed cryogenic hose is 130 times more efficient in saving the consumption of liquid Nitrogen than a regular cryogenic hose. Hose maintains flexibility even with extended periods of cryogenic transfer. The Omega dispenser (1, 2 or 3 hoppers), keeps the mixed cream at 39.2°F (4°C). * Refrigerated cream saves on time preparation, liquid nitrogen and prevents bacteria growth. ​The tank handle 90 degree connector allows to connect the vacuum jacketed hose vertically and is the fastest way to change the dewar liquid Nitrogen tank when the connection is frozen. ​ Save on liquid Nitrogen by controlling its flow to non operational dispensing systems. This fittings (½” Swivel 45°, 90°and Tees with flare ends) are used to easy installation of the vacuum jacketed hoses and to connect several liquid Nitrogen stations using the same Dewar tank. Cryogenic Taylor Wharton Dewar (25, 35 and 50 liters) for liquid nitrogen. The withdrawal device is required to build up pressure inside the tank for the flow of liquid Nitrogen. Absolute zero is the lowest temperature known by humans and it's reached at -459.67 degrees Fahrenheit. The process of making Ice Cream using liquid Nitrogen is simply awesome !! The Liquid Nitrogen has a temperature of -321 degrees Fahrenheit when dispensed, As soon as the liquid Nitrogen touches the cream it starts removing the temperature of the cream from a starting temperature of about 41 degrees Fahrenheit to an ideal Ice Cream serving temperature of 17 degrees Fahrenheit. 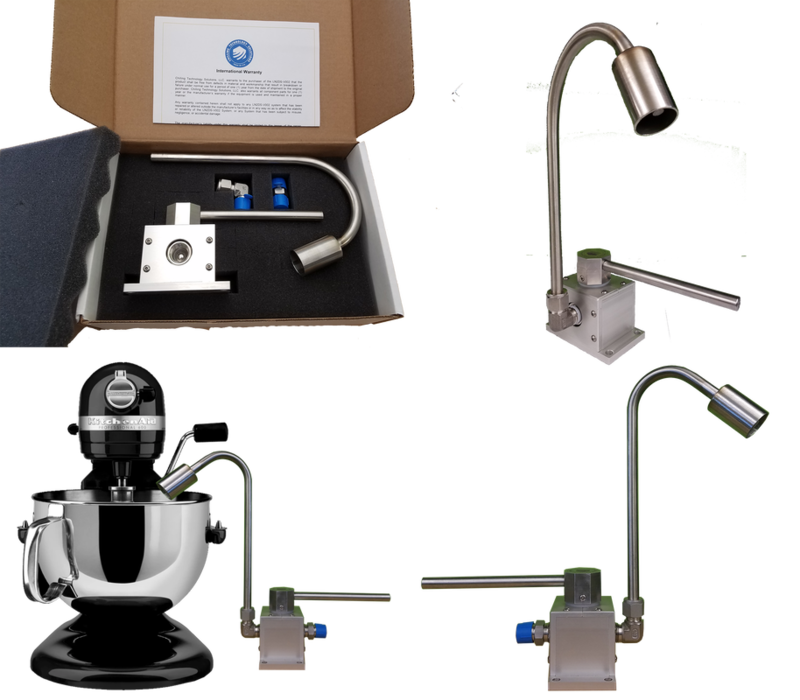 CTS (Chilling Technology Solutions) has developed the safest, reliable and affordable Nitrogen Ice Cream Machine (patent pending) with the most effective dosing system using a Stainless Steel phase separator. This system will allow you to prepare Ice Cream, puffed cereal, dragon breath, cocktails and more. Our food grade dispensing system is made out of Stainless Steel and hard anodized aluminum. Our company can combine the cryogenic technology with any mixer available in the market like Vollrath, KitchenAid, Global, etc. The liquid nitrogen is easily and efficiently controlled with the manual lever to dose the right amount of liquid Nitrogen for your frozen treats, ice cream or desserts. We consult customers to start-up new Liquid Nitrogen Ice Cream stores, please contact us if you need help to design your system. WHY CHILLING TECHNOLOGY SOLUTIONS (C.T.S.) IS THE BEST OPTION? Chilling Technology Solutions is leading the design and manufacturing of liquid Nitrogen Ice cream systems for ice cream and dragon breath.